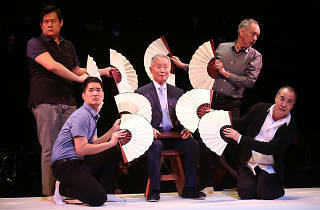 Pacific Overtures, Stephen Sondheim and John Weidman’s musical about the West’s intrusion on Japan in the 19th century, is a show with spectacular demands. The original 1976 production was staged (and written) as a grand Kabuki pageant; the 2002 Japanese-language production at the Lincoln Center Festival went for plainer Noh frills, but offered several breathtaking stage pictures. John Doyle’s revival at Classic Stage Company is less lavish still: It has been boiled down—with all the loss of flavor that implies—to a somber 90-minute procession for 10 actors in modern dress, with the barest suggestion of sets and costumes. The Emperor has dull clothes. Instead of coups de théâtre, this production offers coupures: edits, edits, edits. 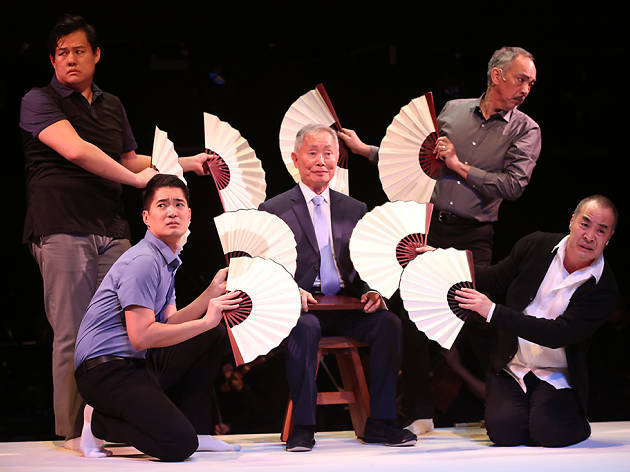 Gone is much of the material that gave Pacific Overtures levity and texture. (Although he loves musical theater, Doyle seems allergic to dance, humor and scenery.) The role of the narrating Reciter has been reduced to a cameo for George Takei. A young woman (Megan Masako Haley) wanders the stage looking lost. Actors find different ways to wear folded swaths of cloth printed with oceanic waves, like actors in an improv game—or in this case, a ponderous improv ritual. One of the show’s cleverest songs, “Chrysanthemum Tea”—which depicts the murder of the impractical Shogun by his duplicitous mother—has been cut entirely, yet Doyle retains the laboriously ribald “Welcome to Kanagawa,” which not even Ann Harada can make funny. Sondheim lovers may jump at the chance to see any live production of this rarely staged work, and the news for them is not all dire. The opening and closing numbers are confusing, but the major middle ones are cleanly handled: “Someone in a Tree” (about the importance and limits of bearing witness) and “Please Hello” (a masterpiece of comic stereotyping, with Kelvin Moon Loh especially amusing as a Russian envoy). It’s the central plot, such as it is—the contrasting stories of samurai Kayama (Steven Eng) and fisherman Manjiro (Orville Mendoza)—that suffers most. Meant as part of a wider canvas, their story doesn’t have the depth to sustain the director’s focus. Doyle’s austerity plan is not always a mistake; it can work when applied to material that badly needs shaping, as in his recent revival of The Color Purple. Here, unfortunately, it is no more successful than it was in his tiresome Peer Gynt last year. Too much of Pacific Overtures is in what he throws away. Striving for leanness, he makes the show seem thin. Classic Stage Company (Off Broadway). Book by John Weidman. Music and lyrics by Stephen Sondheim. Directed by John Doyle. With ensemble cast. Running time: 1hr 30mins. No intermission. Through June 18.